Bill Trotter | BDN With sales of Fireball Cinnamon Whisky rocketing nationwide and in Maine over the past 5 years, the spicy libation has bumped perennial favorite Allen's Coffee Flavored Brandy out of the top spot for best-selling liquor in Maine. The long reign of Allen's Coffee Flavored Brandy as Maine's top-selling liquor has come to an end. The long reign of Allen’s Coffee Flavored Brandy as Maine’s top-selling liquor has come to an end. Fireball Cinnamon Whisky is now the most popular brand of booze in Maine, having outsold Allen’s by half a million dollars in 2018, according to data released Monday by the state. 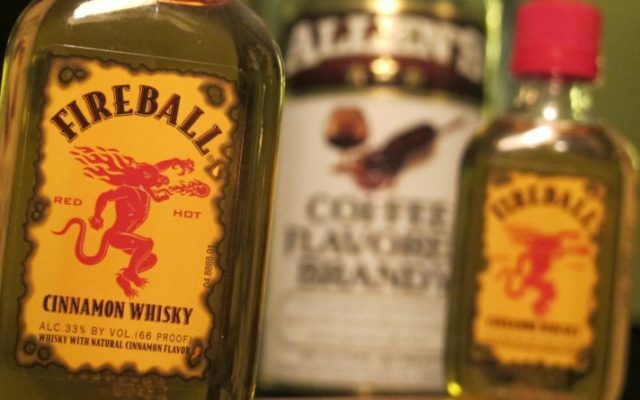 More than $10.1 million worth of Fireball was sold in Maine last year, including $4 million worth of the small, 50-milliliter bottles known as “nips.” Allen’s — nicknamed “the champagne of Maine” for having dominated liquor sales in the state for at least the past 15 years, if not longer — sold $9.6 million worth. It is the first time since at least 2004 that annual sales of Allen’s, which is made by M.S. Walker of Somerville, Massachusetts, have fallen below $10 million in Maine. Sales data in the state prior to 2004 are unavailable. As Allen’s sales have declined, sales of Fireball have surged in Maine and nationwide. The liquor, made by New Orleans-based Sazerac, used to be part of the company’s Dr. McGillicuddy’s line until 2007, when it was rebranded simply as “Fireball” and the fictitious doctor’s name was dropped from the label. Sazerac then made a huge marketing push to popularize the rebranded booze, which, apparently, has worked remarkably well, according to Bloomberg News. Fireball sales took off after Sazerac hired a 25-year-old pitchman named Richard Pomes in 2010 to travel around the country and promote the cinnamon-flavored whiskey at popular bars, according to Bloomberg. A Bloomberg report does not indicate whether Pomes, who resigned as the brand’s ambassador in 2012, or his successor, Bob Bowling, ever brought the spicy libation to Maine. Bloomberg reported that, according to Chicago-based research firm IRI, nationwide sales of Fireball in 2011 amounted to “a mere $1.9 million” at gas stations, convenience stores and supermarkets. In Maine, sales of Fireball have skyrocketed the past few years. In 2013, Fireball’s total statewide sales were $770,000 but they more than doubled in 2014 and again the following year. In 2016 and again in 2017, Fireball’s sales increased in Maine by more than 50 percent. When Fireball’s sales in Maine hit $8.3 million in 2017, it had become the second-most popular brand of liquor in the state, having shot past all other brands except Allen’s.